Fantasy Flight Games is excited to announce Onslaught at Arda I, a full-length adventure supplement for Star Wars®: Age of Rebellion™! 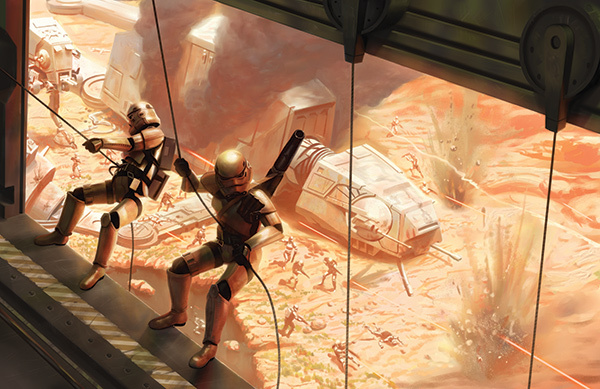 This 96-page adventure is the first in the Star Wars: Age of Rebellion Roleplaying Game line and explores the themes of desperate struggles, tenuous alliances, and an overwhelming enemy. Following its defeat at the Battle of Yavin, the Empire has tightened its grip on the surrounding systems. 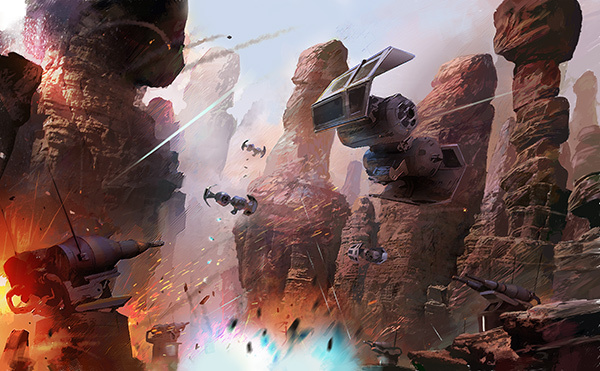 Nearby, a secret Rebel base on Arda I hides in the shadows of a twisting canyon known as the Gauntlet, seemingly safe from planetary sensor scans. When Imperial Star Destroyers appear in orbit the Rebels are caught by surprise and scramble to evacuate before they are overrun…. It falls to a group of new recruits to defend the base from the Imperial onslaught. But the real battle is only beginning, as evidence of treachery emerges from the fog of war. Aces and soldiers must keep the Imperials at bay long enough for the commanders and diplomats to scour the base and fellow Rebels for clues. Mysterious devices found around the base may hold the secret of the traitor’s identity, if spies and engineers can crack their encryption in time. Together, the recruits must investigate the traitor on Jagomir and follow the trail all the way to Ord Radama before precious information falls into the hands of the Imperial Intelligence Service. Onslaught at Arda I will put the players’ problem solving and roleplaying skills to the test in order to whittle down the number of suspects and uncover the real traitor before he can threaten the Rebels once more. Get ready for an action-packed adventure on Arda I. Will you and your fellow recruits be able to uncover the traitor in your midst? Find out when Onslaught at Arda I hits stores in the third quarter of 2014. In the meantime, keep checking back for more news and previews related to Onslaught at Arda I and Star Wars roleplaying!